Bored with your keyboard performance withthatcolor alone or with a background that's it. New York keyboardis akeyboard theme applications that can make you change thebackgroundkeyboard with your own photograph as they pleased. New York Keyboard Emoticons is very easy app to type inEnglishlanguage with amazing themes. This amazing outfit will give you the impression for yoursmartphone keyboard!! A simple User interface which makes NewYorkKeyboard Emoticons very easy to use. Customize the way you type and send messages to yourfriends! !Select the Photo from the Gallery or Click a new Photo andset themas your keyboard background. My Photo Keyboard Emoticons isby farthe best keyboard application you have ever seen. The background can be anything, it can be your own photo, orphotoof your loved ones or any background you love. You can takethephoto from your mobile's gallery or click one from yourmobilecamera. • Just enable this keyboard Emoticons by clicking on'EnableKeyboard' and choose ‘ New York iKeyboard Emoticons '. • Select 'Set Input Methods' as a ‘ New York Keyboard '. • Select 'Choose Background' to Choose the Photo from the GalleryorClick a new Photo or Pre Photos. • "Set Language" option to change your default language. • We give you over 10 different types of Keyboard themes. • Choose you favorite emoji or smiley to your friends or familytoexpress your feelings. • We provide best emoji emoticons to share your feelings. • We also give you HD Wallpaper background theme. you canchooseyour favorite theme and set as your keyboardEmoticonsbackground. This New York iKeyboard Emoticons app compatible withmajorsmartphone. but still your device doesn’t support it thenpleaselet as know and give your feedback. 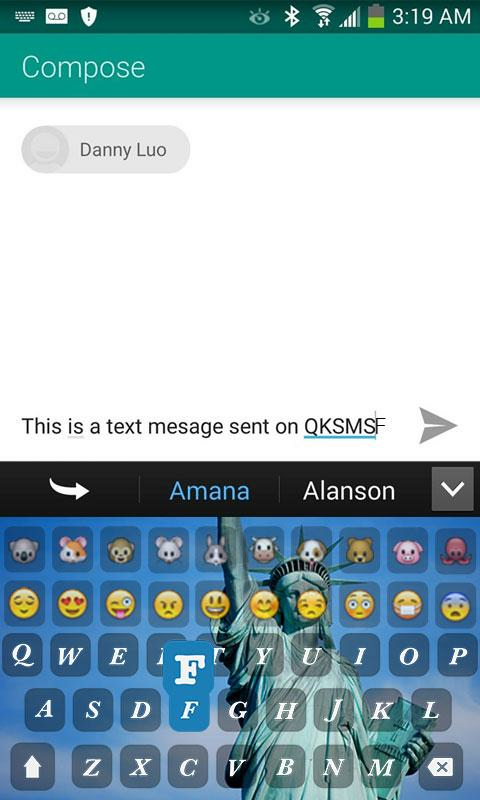 If you any query regarding this New York iKeyboard Emoticonsappthen please contact us. If you like this New York iKeyboard Emoticons then please rateusand give your comment and share this app with your friendsadfamily. Bored with your keyboard performance withthatcolor alone or with a background that's it. Taj Mahal keyboardis akeyboard theme applications that can make you change thebackgroundkeyboard with your own photograph as they pleased.Taj Mahal Keyboard Emoticons is very easy app to type inEnglishlanguage with amazing themes.This amazing outfit will give you the impression for yoursmartphone keyboard!! A simple User interface which makes TajMahalKeyboard Emoticons very easy to use.Customize the way you type and send messages to yourfriends! !Select the Photo from the Gallery or Click a new Photo andset themas your keyboard background. Taj Mahal Photo KeyboardEmoticons isby far the best keyboard application you have everseen.The background can be anything, it can be your own photo, orphotoof your loved ones or any background you love. You can takethephoto from your mobile's gallery or click one from yourmobilecamera.Taj Mahal iKeyboard Emoticons Theme App Feature ::• Just enable this keyboard Emoticons by clicking on'EnableKeyboard' and choose ‘ Taj Mahal iKeyboard Emoticons'.• Select 'Set Input Methods' as a ‘ Taj Mahal Keyboard '.• Select 'Choose Background' to Choose the Photo from the GalleryorClick a new Photo or Pre Photos.• "Set Language" option to change your default language.• We give you over 10 different types of Keyboard themes.• Choose you favorite emoji or smiley to your friends or familytoexpress your feelings.• We provide best emoji emoticons to share your feelings.• We also give you HD Wallpaper background theme. you canchooseyour favorite theme and set as your keyboardEmoticonsbackground.This Taj Mahal iKeyboard Emoticons app compatible withmajorsmartphone. but still your device doesn’t support it thenpleaselet as know and give your feedback.If you any query regarding this Taj Mahal iKeyboard Emoticonsappthen please contact us.If you like this Taj Mahal iKeyboard Emoticons then please rateusand give your comment and share this app with your friendsadfamily. Bored with your keyboard performance withthatcolor alone or with a background that's it. Exotic keyboard isakeyboard theme applications that can make you change thebackgroundkeyboard with your own photograph as they pleased.Exotic Keyboard Emoticons is very easy app to type inEnglishlanguage with amazing themes.This amazing outfit will give you the impression for yoursmartphone keyboard!! A simple User interface which makesExoticKeyboard Emoticons very easy to use.Customize the way you type and send messages to yourfriends! !Select the Photo from the Gallery or Click a new Photo andset themas your keyboard background. Exotic Photo KeyboardEmoticons is byfar the best keyboard application you have everseen.The background can be anything, it can be your own photo, orphotoof your loved ones or any background you love. You can takethephoto from your mobile's gallery or click one from yourmobilecamera.Exotic iKeyboard Emoticons Theme App Feature ::• Just enable this keyboard Emoticons by clicking on'EnableKeyboard' and choose ‘ Exotic iKeyboard Emoticons '.• Select 'Set Input Methods' as a ‘ Exotic Keyboard '.• Select 'Choose Background' to Choose the Photo from the GalleryorClick a new Photo or Pre Photos.• "Set Language" option to change your default language.• We give you over 10 different types of Keyboard themes.• Choose you favorite emoji or smiley to your friends or familytoexpress your feelings.• We provide best emoji emoticons to share your feelings.• We also give you HD Wallpaper background theme. you canchooseyour favorite theme and set as your keyboardEmoticonsbackground.This Exotic iKeyboard Emoticons app compatible withmajorsmartphone. but still your device doesn’t support it thenpleaselet as know and give your feedback.If you any query regarding this Exotic iKeyboard Emoticons appthenplease contact us.If you like this Exotic iKeyboard Emoticons then please rate usandgive your comment and share this app with your friendsadfamily. Bored with your keyboard performance withthatcolor alone or with a background that's it. Windmill keyboardis akeyboard theme applications that can make you change thebackgroundkeyboard with your own photograph as they pleased.Windmill Keyboard Emoticons is very easy app to type inEnglishlanguage with amazing themes.This amazing outfit will give you the impression for yoursmartphone keyboard!! A simple User interface which makesWindmillKeyboard Emoticons very easy to use.Customize the way you type and send messages to yourfriends! !Select the Photo from the Gallery or Click a new Photo andset themas your keyboard background. Windmill Photo KeyboardEmoticons isby far the best keyboard application you have everseen.The background can be anything, it can be your own photo, orphotoof your loved ones or any background you love. You can takethephoto from your mobile's gallery or click one from yourmobilecamera.Windmill iKeyboard Emoticons Theme App Feature ::• Just enable this keyboard Emoticons by clicking on'EnableKeyboard' and choose ‘ Windmill iKeyboard Emoticons '.• Select 'Set Input Methods' as a ‘ Windmill Keyboard '.• Select 'Choose Background' to Choose the Photo from the GalleryorClick a new Photo or Pre Photos.• "Set Language" option to change your default language.• We give you over 10 different types of Keyboard themes.• Choose you favorite emoji or smiley to your friends or familytoexpress your feelings.• We provide best emoji emoticons to share your feelings.• We also give you HD Wallpaper background theme. you canchooseyour favorite theme and set as your keyboardEmoticonsbackground.This Windmill iKeyboard Emoticons app compatible withmajorsmartphone. but still your device doesn’t support it thenpleaselet as know and give your feedback.If you any query regarding this Windmill iKeyboard Emoticonsappthen please contact us.If you like this Windmill iKeyboard Emoticons then please rateusand give your comment and share this app with your friendsadfamily. My Photo KeyboardAre you want amazing customize keyboard?Are you wanted to set your own photo on keyboard background in yourmobile?Here My Photo Keyboard app helps you to customize your keyboard andset your photo as keyboard background with Styles keypadcharacters.Around 1 million users used “MY PHOTO KEYBOARD” free app fromgoogle play store.My photo keyboard is really dashing app because you set your ownphoto or any gallery image as keyboard background in yourdevice.When you installed my photo keyboard it will applicable to wholedevice and for all apps.It’s really simple to change keyboard background photos fromgallery or device camera.Features Set Photo From Gallery or Camera. Set Different Types Of Themes from list. Auto spelling Check Facility. Easy Next Word Prediction. Horizontal and Vertical Keyboard background Set separately. 50+ Language Supported. 100+ Font Style Supported. Keyboard Height Setting. Keyboard Font Color Setting. Keyboard Key press setting as sound,vibration etc. Support also in Tablet. Cool & Fancy Font Supported.How to use ?1. Click on "Enable Keyboard" and then check mark "My PhotoKeyboard".2. Click on "Set Input Methods" and then checkmark "My Photokeyboard".3. Click 'Change image' to choose the Photo from the Gallery ordevice camera.4. Click on "Set theme" and select your favorite theme fromlist.5. "Change Language" option to change your default language.6. Click on “change font style” to select styles font forkeyboard. ★ My Photo Keyboard is a very simple app toType in English with great themes.You can send emoji with very cute and smiles. Moreover app withvery fine fonts that give very beautiful appearance on yourkeyboard.★ With My Photo Keyboard, Now you can add your own photos on yourkeyboard background with this application. Set photograph ofthemselves or their loved ones as your keyboard or the keyboard inthe background. For the 1st time on Android !! This gallerykeyboard is certainly the best of its kind.★ My photo keyboard Themes with multiple languages. Ask differentbackground in the keyboard by picture from the gallery or capturephoto.★ My Photo Keyboard is breathtaking application put your own photosas background keyboard. 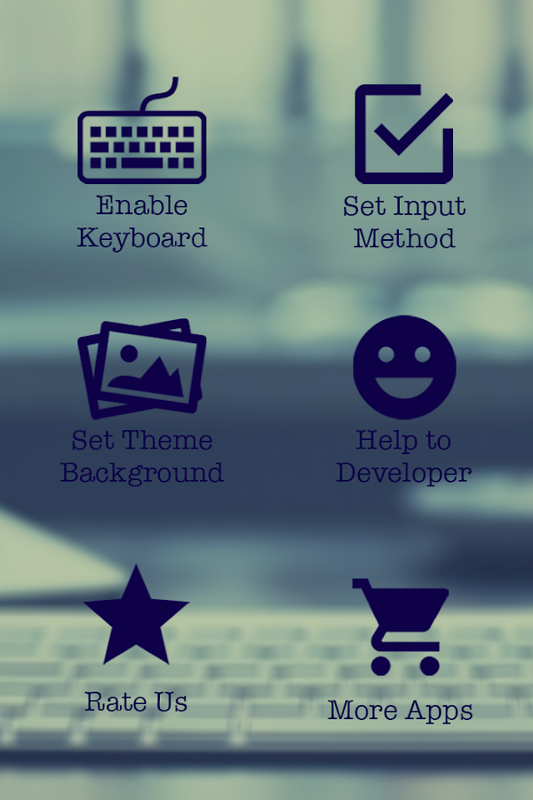 This application offers different theme ofthe keyboard. Choose any topic and make your photo. Select yourphoto from camera and gallery. This key board is the use of devicesall use also you anytime your Key board issue which also turned onor off the keypad sound.★ My Photo Keyboard allows to you to Enable or disable thisapplication. Change your photo and enter your machine's stunningviews. Even enter different theme keyboard with different colors ordifferent style.How to Used?1. Open App My Photo keyboard.2. Select " My Photo Keyboard" button.3. Text Input Method my photo keyboard (optional).4. image from the Gallery or camera, and you will get a preview ofthe keyboard.5. You can select various colorful themes for keyboards.6. My photo keyboard come with more than 50 languages.Features :★★ Enable keyboard from our app itself.★★ Beautiful background by image from gallery or capture photosfrom your camera.★★ App with such pretty themes, decorate your keyboard.★★ My photo keyboard app offers more than 50 languages.★★ Different font styles available.★★ Change the setting of the keyboard app itself.★★ Ask. Different background for portrait and landscapeformat★★Over 100 emoji and smiles available.★★You can edit the text or highlight the message of the keyboardas text, copy, paste and many more.★★ ANY PROBLEMS IN APPLYING THEME ? E-MAIL US !! ★★Hope you enjoy this application and your feedback will beappreciated.Thank you. My Photo Keyboard is very easy app to type in English language withamazing themes. Moreover app having very fine fonts which will givevery nice look to your keyboard. My Photo Keyboard having manylanguages. Set different background in keyboard by selecting imagefrom gallery or capture photo. My Photo Keyboard applies to wholedevice and for all apps. Make your keyboard very beautiful as yourchoice. This amazing outfit will give you the impression for yoursmartphone keyboard!! With over 10 different types of keyboardthemes. 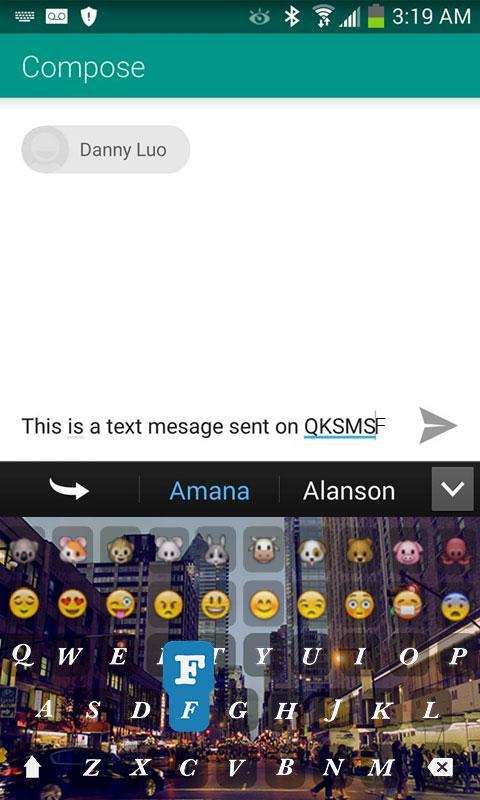 Customize the way you type and send messages to yourfriends!! My Photo Keyboard App Feature ::= * Just enable thiskeyboard by clicking on 'Enable Keyboard' and choose 'My PhotoKeyboard'. * Select 'Set Input Methods' as a 'My Photo Keyboard'. *Select 'Choose theme' to choose your favorite Keyboard theme. *Select 'Choose Background' to Choose the Photo from the Gallery orClick a new Photo or Pre Photos. * "Set Language" option to changeyour default language. * We give you over 10 different types ofKeyboard themes. * We also give you HD Wallpaper background theme.you can choose your favorite theme and set as your keyboardbackground. If you like this My Photo Keyboard app then please rateus and give your comment. Share this amazing My Photo Keyboard appwith your friends and family member. If you like this My PhotoKeyboard is useful then please provide your feedback on belowDeveloper email id. We are happy to hearing you. Download and Enjoyit. Bored with your keyboard performance withthatcolor alone or with a background that's it. Photo keyboard isakeyboard theme applications that can make you change thebackgroundkeyboard with your own photograph as they pleased.Photo Keyboard Emoticons is very easy app to type inEnglishlanguage with amazing themes.This amazing outfit will give you the impression for yoursmartphone keyboard!! A simple User interface which makes PhotoKeyboardEmoticons very easy to use.Customize the way you type and send messages to yourfriends! !Select the Photo from the Gallery or Click a new Photo andset themas your keyboard background. My Photo Keyboard Emoticons isby farthe best keyboard application you have ever seen.The background can be anything, it can be your own photo, orphotoof your loved ones or any background you love. You can takethephoto from your mobile's gallery or click one from yourmobilecamera.Photo iKeyboard Emoticons Theme App Feature ::• Just enable this keyboard Emoticons by clicking on'EnableKeyboard' and choose ‘ Photo iKeyboard Emoticons '.• Select 'Set Input Methods' as a ‘ Photo Keyboard '.• Select 'Choose Background' to Choose the Photo from the GalleryorClick a new Photo or Pre Photos.• "Set Language" option to change your default language.• We give you over 10 different types of Keyboard themes.• Choose you favorite emoji or smiley to your friends or familytoexpress your feelings.• We provide best emoji emoticons to share your feelings.• We also give you HD Wallpaper background theme. you canchooseyour favorite theme and set as your keyboardEmoticonsbackground.This Photo iKeyboard Emoticons app compatible withmajorsmartphone. but still your device doesn’t support it thenpleaselet as know and give your feedback.If you any query regarding this Photo iKeyboard Emoticons appthenplease contact us.If you like this Photo iKeyboard Emoticons then please rate usandgive your comment and share this app with your friendsadfamily. You can make your own photos as backgroundkeyboard. Changing keyboard background from the gallery or camera .With this application make the best photo into a trimmer keyboardfor your android . Photo This keyboard also features 22 themekeyboard keyboard option that makes you more beautiful. Bored with your keyboard performance withthatcolor alone or with a background that's it. Paris keyboard isakeyboard theme applications that can make you change thebackgroundkeyboard with your own photograph as they pleased.Paris Keyboard Emoticons is very easy app to type inEnglishlanguage with amazing themes.This amazing outfit will give you the impression for yoursmartphone keyboard!! A simple User interface which makes ParisKeyboardEmoticons very easy to use.Customize the way you type and send messages to yourfriends! !Select the Photo from the Gallery or Click a new Photo andset themas your keyboard background. My Photo Keyboard Emoticons isby farthe best keyboard application you have ever seen.The background can be anything, it can be your own photo, orphotoof your loved ones or any background you love. You can takethephoto from your mobile's gallery or click one from yourmobilecamera.Paris iKeyboard Emoticons Theme App Feature ::• Just enable this keyboard Emoticons by clicking on'EnableKeyboard' and choose ‘ Paris iKeyboard Emoticons '.• Select 'Set Input Methods' as a ‘ Paris Keyboard '.• Select 'Choose Background' to Choose the Photo from the GalleryorClick a new Photo or Pre Photos.• "Set Language" option to change your default language.• We give you over 10 different types of Keyboard themes.• Choose you favorite emoji or smiley to your friends or familytoexpress your feelings.• We provide best emoji emoticons to share your feelings.• We also give you HD Wallpaper background theme. you canchooseyour favorite theme and set as your keyboardEmoticonsbackground.This Paris iKeyboard Emoticons app compatible withmajorsmartphone. but still your device doesn’t support it thenpleaselet as know and give your feedback.If you any query regarding this Paris iKeyboard Emoticons appthenplease contact us.If you like this Paris iKeyboard Emoticons then please rate usandgive your comment and share this app with your friendsadfamily. Bored with your keyboard performance withthatcolor alone or with a background that's it. Pink Love keyboardis akeyboard theme applications that can make you change thebackgroundkeyboard with your own photograph as they pleased.Pink Love Keyboard Emoticons is very easy app to type inEnglishlanguage with amazing themes.This amazing outfit will give you the impression for yoursmartphone keyboard!! A simple User interface which makes PinkLoveKeyboard Emoticons very easy to use.Customize the way you type and send messages to yourfriends! !Select the Photo from the Gallery or Click a new Photo andset themas your keyboard background. My Photo Keyboard Emoticons isby farthe best keyboard application you have ever seen.The background can be anything, it can be your own photo, orphotoof your loved ones or any background you love. You can takethephoto from your mobile's gallery or click one from yourmobilecamera.Pink Love iKeyboard Emoticons Theme App Feature ::• Just enable this keyboard Emoticons by clicking on'EnableKeyboard' and choose ‘ Pink Love iKeyboard Emoticons'.• Select 'Set Input Methods' as a ‘ Pink Love Keyboard '.• Select 'Choose Background' to Choose the Photo from the GalleryorClick a new Photo or Pre Photos.• "Set Language" option to change your default language.• We give you over 10 different types of Keyboard themes.• Choose you favorite emoji or smiley to your friends or familytoexpress your feelings.• We provide best emoji emoticons to share your feelings.• We also give you HD Wallpaper background theme. you canchooseyour favorite theme and set as your keyboardEmoticonsbackground.This Pink Love iKeyboard Emoticons app compatible withmajorsmartphone. but still your device doesn’t support it thenpleaselet as know and give your feedback.If you any query regarding this Pink Love iKeyboard Emoticonsappthen please contact us.If you like this Pink Love iKeyboard Emoticons then please rateusand give your comment and share this app with your friendsadfamily. My Photo Keypad Lock Screen Feature :-> -> Set your Photowith different shapes to more creative. -> Set Wallpaper fromyour gallery. -> Default wallpaper also available in my photolock screen. -> Enable & Disable Lockscreen to more secureyour phone. -> Set Passcode , Change Passcode and Slide tounlock phone. -> Check Preview and check lock screen theme.-> Set Theme Whatever you wish. -> 20 HD wallpaper pluschoose pic from gallery also available in my photo keypadlockscreen. -> Vibrate on/off. -> Sound on/off. -> Slidingtext set custom whatever you wish in this lock screen. -> SetMobile operator name as well as change custom also. -> RandomKeypad system available to more secure your password. -> ChangeDate , Time and Sliding text color you wish. -> Reach LockscreenThemes. -> More Protection your phone with Pass code & Slideto unlock. Thanks for Downloading My Photo Keypad Lock Screen.